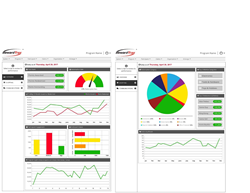 Incentive Solutions releases new client Administrative Dashboards technology. The Admin Dashboards are now available and ready to use by all incentive program holders. For the first time, an incentive company has the tools and analytics for you to see a snapshot of important aspects of your program, and then respond accordingly. Incentive Solutions, provider of incentive programs and employee recognition programs, is excited to announce the release of Administrative Dashboards for their incentive technology platform. The cutting-edge technology shows administrators important key performance indicators (KPI’s) to assist clients in making the best possible decisions regarding their online incentive program. The Dashboards allow rewards program holders to see what is working and what is not. What are their clients attracted to within the program? What seems to be lacking appeal? Is their incentive program effective or not? These features help admins better engage clients with their program. With the use of the new Dashboard analytics, program holders can set new goals for themselves without the guesswork. When speaking about the new incentive technology, Patrick O’Brien, Business Analyst at Incentive Solutions, said, “For the first time, an incentive company has the tools and analytics for you to see a snapshot of important aspects of your program, and then respond accordingly.” The new Admin Dashboard technology will allow clients to create a user experience that will lead to the most successful performance in their rewards programs. The Incentive Solutions’ Dashboard technology is live and is ready to be implemented, with the promise of new Dashboards to be released in the future. Incentive Solutions, Inc., founded in 1994 based in Atlanta, GA, offers online rewards, travel incentives and gift card rewards. Since its creation, Incentive Solutions has focused on delivering more than just rewards, innovating the incentive industry by utilizing emerging online technologies. Acting as valued partner and trusted advisor to clients, they help organizations increase sales, motivate employees, build customer loyalty, create positive work environments and improve channel sales relationships.